The clues turned out to be remarkably straightforward, nay easy. Inside fifteen minutes, the grid had a good smattering of about twenty entries. Thanks, FT. Sadly, none of them required any amendment to the clues, and I was still very much in the dark about 1ac. Of those descending from the top row, I currently had 1, 3, 4, 6, 7 and 8. Of those, only 4 EVER SO, 7 ENEW and 8 STRIDE appeared to have unambiguous extra letters added to the front, giving REVERSO (! ), RENEW and ASTRIDE. 29ac was In public I love a smoke, and it looked like the answer was CIG, which meant that a G was probably missing from the beginning of ‘love’. I must say that having only nine of these pesky clues to spot, I frequently forgot to remind myself about them. For instance, 42ac Cover with some lacier material was ICE, and I wondered what that had to do with lace! Eventually, of course, another G had to be added to the clue to give ‘glacier’. 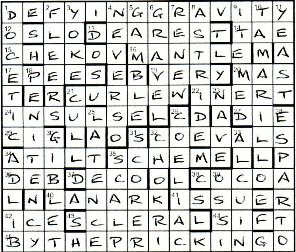 And so the grid gradually filled up, although not quite as quickly as the first twenty clues made me think it would … typical Listener then. I got the bottom row BY THE PRICKING O[f] which I had originally dismissed as an anagram because ‘key pitch robin’ only had 14 letters. With my new found knowledge about missing Gs, I eventually revisited the clue and realised it should read Key pitch robing trills since the Gs weren’t all added to the front of a word. I was a bit puzzled by the omission of the F since it seemed to be a forced requirement just to fit the 14 cell wide grid. So there were nine clues which had a G dropped … actually all Gs dropped, since 2dn Lances furtively stolen from kin, hidden in sediment became Glances furtively stolen from king, hidden in sediment, ie R (king) hidden in LEES (sediment). So this device explained the title, with G for good going from these clues. Eventually, 1ac revealed itself. Having toyed with the second word being TRAGEDY and TRAVESTY if 6dn RAVEL became TRAVEL, I found GRAVITY with 6dn becoming GRAVEL. 1dn DOCETIC meant the first word began with D … for DEFYING. REVERSO was, of course, wrong, and became NEVER SO; I liked the way that the two words notation applied to the clued and the extended word. I was disappointed, however, not to find the phrase DEFYING GRAVITY in Chambers under either word, although the G that was dropped from the clues also related to gravity. So there it was … a finished grid, with DEFYING GRAVITY at 1ac and BY THE PRICKING O at 45ac. And absolutely no idea what the connection was between the two. Or three, if you include Flying Tortoise. I obviously knew that the continuation of 45ac was from Macbeth “By the pricking of my thumbs, Something wicked this way comes”, but, apart from seeing another explanation of the title, I was none the wiser. Ans so I could have happily (or, rather, unhappily) popped my entry into its envelope and posted it without having a clue as to what was going on. Except that Google came to the rescue again. Defying Gravity is a song (the song?) from the musical Wicked, currently in the West End, but not a show that I have seen. But I hadn’t needed to know that to complete the grid. Was I missing something? I held off posting my entry for a few days wondering what that something was … apart from only having eight clues missing its Gs. I had 29, 41, 42, 44, 45 across and 2, 23, 26 down. Where was the ninth? Twice through the clues and it still eluded me! Oh well, it must be there somewhere. This was a very unsatisfactory state of affairs, but the entry finally went off to St Albans with questions unanswered. I decided to await the publication of the solution to explain what, if anything, I had overlooked. Expect to see a postscript here later if I’ve messed up! This entry was posted on 12 October 2012 at 4:00 pm	and is filed under Solving Blogs. You can follow any responses to this entry through the RSS 2.0 feed. You can leave a response, or trackback from your own site. I think the ninth clue with the missing G is 33d – round becoming ground (the anagrind for uncial), although Alcuin did write in round uncial letters.